Launcher elements “from bottom to top” for Arianespace Flight VA233 with an Ariane 5 ES vehicle are shown during their unloading at Pariacabo Port in French Guiana for transfer to the Spaceport. They are (left to right): the main stage, the EPS upper stage, and Ariane 5’s payload fairing. 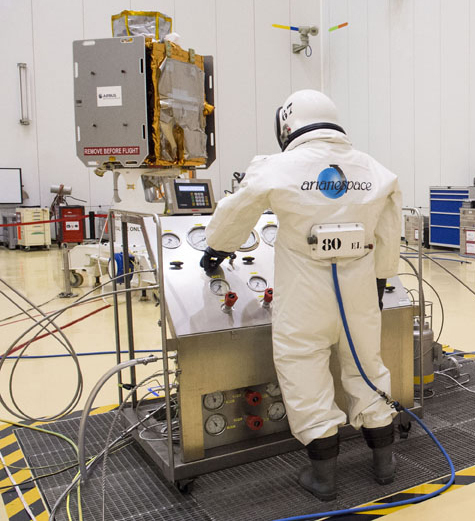 Flight VA233 will orbit four Galileo satellites in November. The diversity of Arianespace launch services available to commercial and institutional customers is underscored by the current mission preparations for flights that will orbit Earth observation platforms, telecommunications relay spacecraft and global navigation satellites from the Spaceport. Sun-synchronous orbit for high-resolution imaging with Peru’s first Earth observation satellite. As part of the ongoing activity, launcher components for Arianespace’s initial Ariane 5 mission carrying Galileo satellites arrived in French Guiana this week aboard the MN Colibri ship, completing a trans-Atlantic voyage from Europe. Scheduled for liftoff in November, this Ariane 5 will carry a cluster of four European navigation system spacecraft, further expanding the Galileo constellation that has been created with satellites orbited in pairs by previous Arianespace missions using Soyuz launchers. 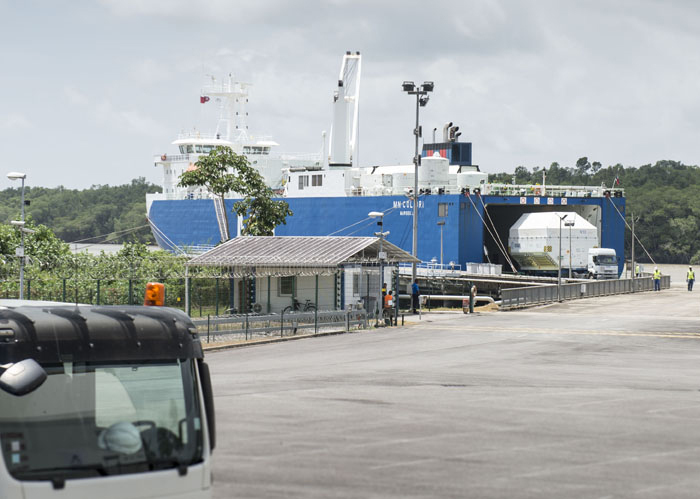 The MN Colibri roll-on/roll-off ship is unloaded at Pariacabo Port after arriving in French Guiana. Among the components delivered by the MN Colibri were Ariane 5’s cryogenic core stage, its EPS storable propellant upper stage, and the payload fairing for Arianespace’s November mission – designated Flight VA233 in the company’s launcher family numbering system. These elements were unloaded at Pariacabo Port on the Kourou River for their transfer to the nearby Spaceport. Flight VA233 will use an Ariane 5 ES version, which was flown on Arianespace launches in the past that deployed Europe’s 20,000-kg.-class ATV resupply vehicle into low-Earth orbit for rendezvous and docking with the International Space Station. While Flight VA233’s lift performance will be significantly less than with the ATV – the four Galileo satellites have a liftoff mass of some 740 kg. each, plus 447 kg. for their dispenser system – the Ariane 5 will carry its payload to a much higher medium-Earth orbit altitude of approximately 23,200 km. To date, Arianespace has orbited 14 Galileo spacecraft on seven previous Soyuz missions; the most recent was conducted in May. The Ariane 5 ECA launcher for Flight VA232 rolled out today to the Spaceport’s launch zone for liftoff tomorrow, August 24. As Flight VA233 is ready to move into the preparation phase, another Ariane 5 mission enters its countdown as Flight VA232 is poised for launch tomorrow carrying a pair of Intelsat satellites. 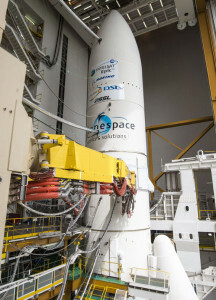 This Ariane 5 ECA version was transferred today to the Spaceport’s ELA-3 launch zone. With a liftoff during a 45-minute launch window opening at 6:55 p.m. local time in French Guiana on August 24, Intelsat 33e and Intelsat 36 are to be deployed into geostationary transfer orbit during a 41-minute mission. Flight VA232 marks Arianespace’s sixth launch so far in 2016, and the fourth since January utilizing an Ariane 5. Peru’s PerúSAT-1 Earth observation satellite is fueled in the Spaceport’s S3B facility in preparation for a September orbiting by Arianespace’s Vega launcher. 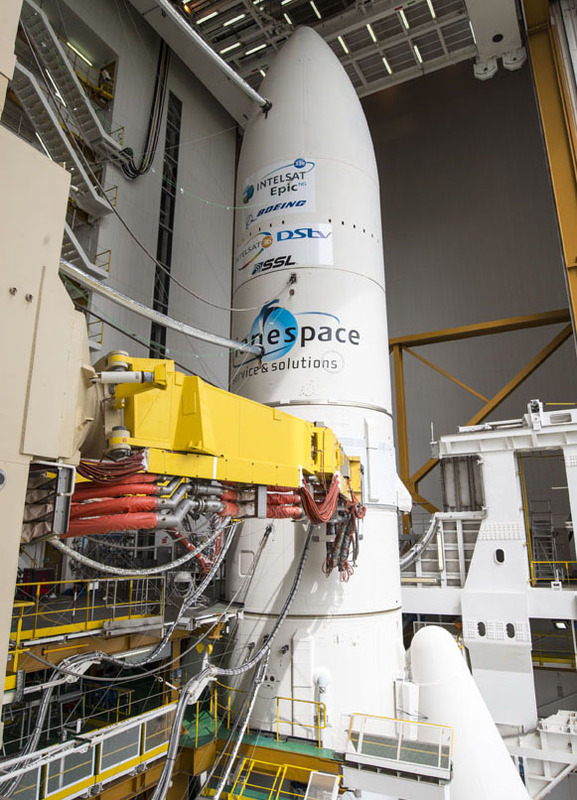 Elsewhere at the Spaceport, preparations are continuing for Arianespace’s September 15 launch of a lightweight Vega vehicle – as this mission’s PerúSAT-1 Earth observation satellite has now been fueled in the S3B payload preparation facility. PerúSAT-1 is equipped with a silicon carbide optical instrument system to image Earth at 70 cm. resolution, and will serve as Peru’s first Earth observation satellite. With a liftoff mass of approximately 450 kg., PerúSAT-1 will operate from Sun-synchronous orbit. The Vega mission with PerúSAT-1 is designated Flight VV07 in Arianespace’s launcher family numbering system, signifying the light-lift vehicle’s seventh launch overall, and its first in 2016 from Europe’s Spaceport in French Guiana.